Niantic confirmed some time ago that it will be disabling gyms in the near future, in order to introduce new gym mechanics and gameplay features. And, as you might have seen, gyms are no longer functioning, as of Monday. When Niantic disabled the gyms, it also released a detailed description of what its additions to the AR game will be. Starting soon, new gym mechanics will be in place. The prestige system will be completely removed, and all gyms will always have six Pokemon slots in them. The catch is that there can be no duplicate Pokemon in one gym. If there is one Snorlax in there, no one can assign a second to the same gym. Additionally, a new motivation system will be introduced. Pokemon will have certain motivation, which will gradually fall with time, unless trainers of the same team feed that Pokemon berries. As motivation drops, so will the Pokemon's CP, and once it runs out of motivation, it will return to its trainer upon next defeat. The good news is that the CP drop is temporary, and only for that gym. Once the Pokemon returns to the trainers, or has its motivation improved, the CP will return to its original value. Additionally, attacking trainers will not fight the weakest Pokemon first. Instead, they will fight the Pokemon that has been in the gym the longest, no matter of its CP. Gyms will also serve as PokeStops, so anyone can walk by it and spin the photo disc for some in-game goodies. Another addition to the gym system will be the Gym Badges. They will not work the same way as in the original games, but they will still serve as a mark of valor. Each gym will have three levels of badges – bronze, silver, and gold. Trainers can raise their badge to the next level by battling with the Pokemon in the gym, giving berries to them, or spinning the gym's photo disc. Raising the level of the specific gym badge will increase a trainer's chance to get better items and rewards from that specific gym. Additionally, there will be a new Raid Battle feature. It will work similarly to raids in MMO games, where a large number of players play together in order to defeat a powerful boss. Said raids will also happen at gyms. When a raid is about to begin at a gym, a large egg will appear above the gym's marker, with a countdown timer. When that reaches zero, the a powerful Pokemon will appear, and the battle begins. Up to 20 trainers can gather for a raid, and they will have five minutes to defeat the Raid Boss Pokemon. If they do, all of them will be given the chance to catch said powerful Pokemon the regular way – with berries and Pokeballs. In addition, you Raid Bosses will drop new items which will not be available through any other activity in the game, such as new berries, new candies, and two technical machines – Fast and Charged – which can be used to permanently teach a Pokemon new attacks. In order to take part in a raid, you will need to acquire a Raid Pass. You can get one a day for free by spinning gym photo discs, but you need to spend it before you can get a new one the next day. If you require more than one Raid Pass, you will be able to purchase them from the in-game store. Niantic says that once the update is rolled out to all trainers, the new activities will be enabled. 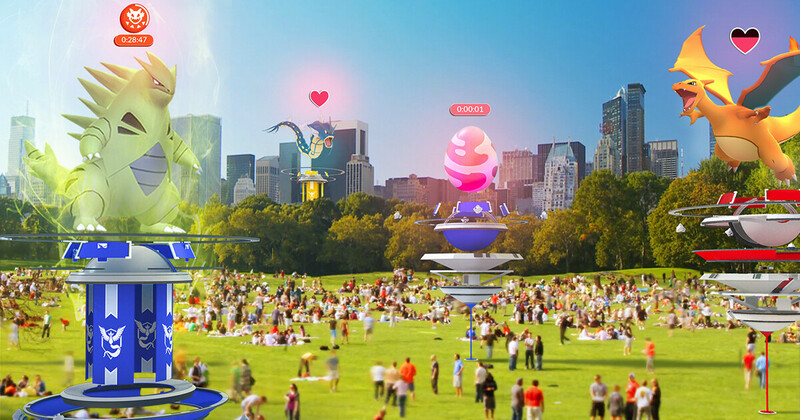 Raid Battles will be in closed beta, however, and Niantic will gradually scale the number of players that are in it. One raid a day.. come on man its summer.